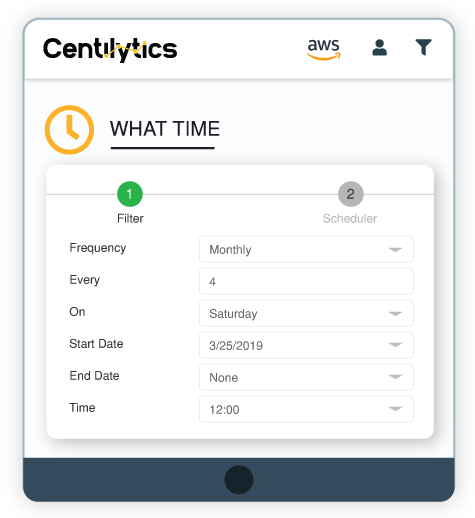 Our cloud automation brings in business efficiency by allowing workload scheduling, lifecycle management, automated backups and much more to reduce human effort on operational activities. 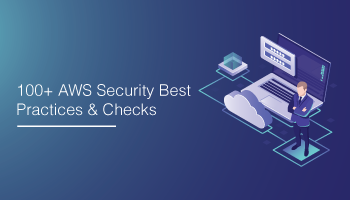 We automate your cloud ecosystem, enabling your business to entice productive decisions and ensure that the same standards are followed all across the organization. 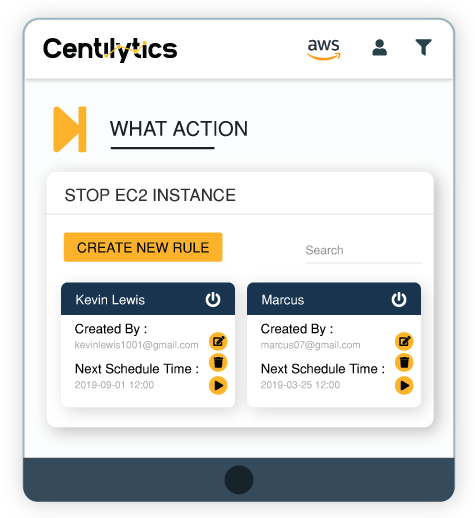 With Centilytics automating your day-to-day operational tasks, you need not to manually maintain the regular hygiene of your cloud. We identify inefficiencies in your infrastructure so that you can fix or remove them with a button’s click right from our console. Create rules for how long you want your resources to stick around, rules for cleaning up unallocated assets, unattached volumes, creating snapshots or deleting them; and whatever that takes up your man-hours. 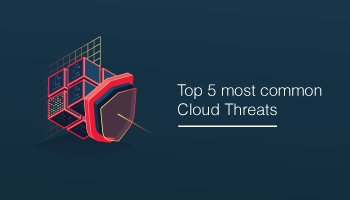 You can also switch the visibility of publicly accessible cloud services and resources to private. 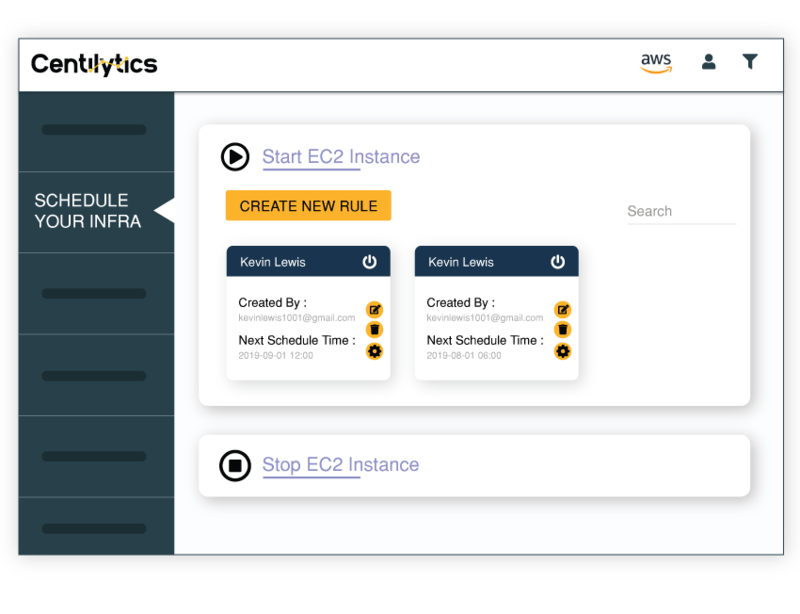 Now your infrastructure can run on a fixed schedule without having to worry about the tasks getting done on time. Schedule your day-to-day errands such as the start time of your assets and their shutdown during weekends, nights or when they aren’t in use to cut down superfluous costs from your bill. Similarly, schedule automated backups of your assets to reduce operational efforts. Automating and managing the entire process of your regular tasks on the basis of their priority and criticality is no more an arduous task. 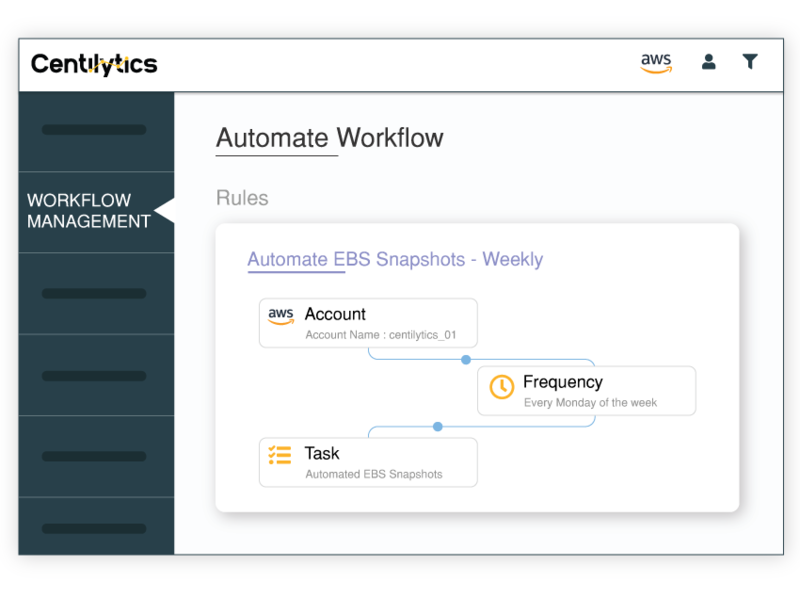 Let’s say you want to automate the workflow of your snapshot lifecycle management. 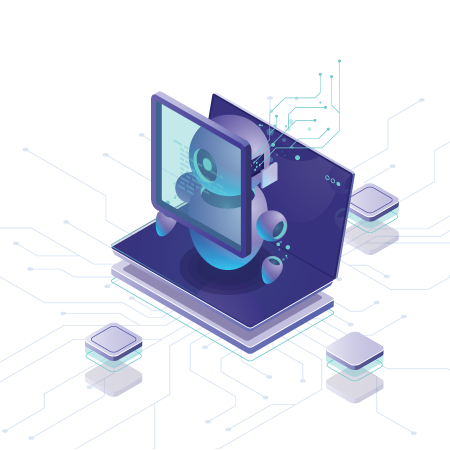 Just define the rules and steps to manage your snapshots and we will automate the entire procedure, right from the creation of the snapshot(s), taking regular backups as scheduled, retaining them for as long as you want, and deleting them once they are of no use. Flag rules on which resources or workloads you want to perform your tasks on. 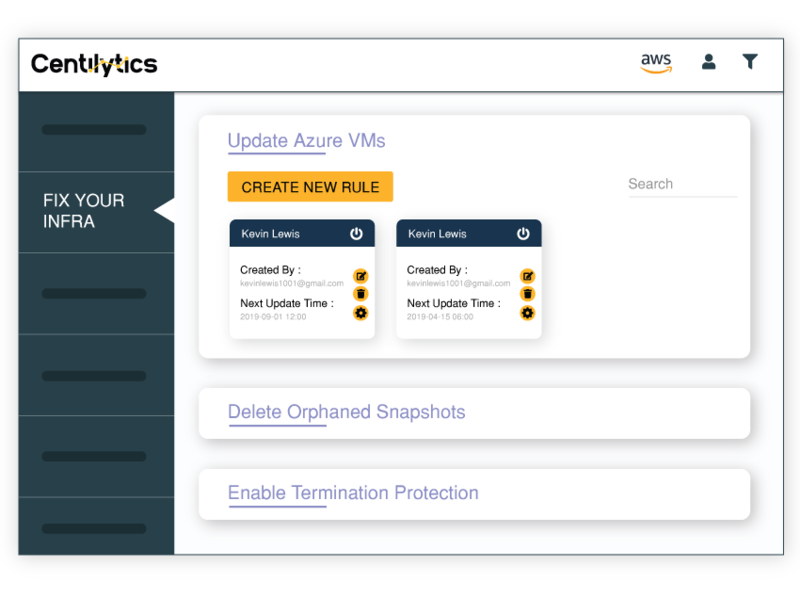 While you define rules and rule-driven alerts on what action you want to perform across your cloud, we automate that for you. Schedule when you want your tasks to be performed and we will make sure that it’s done directly from our console. 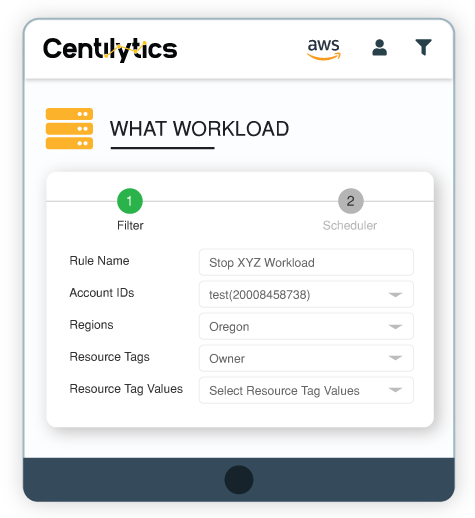 "...provides valuable insights into our AWS infrastructure..."
"...cost-effective way to gain granular visibility into our infra..."
"...cloud billing through Centilytics was a seamless process and..."